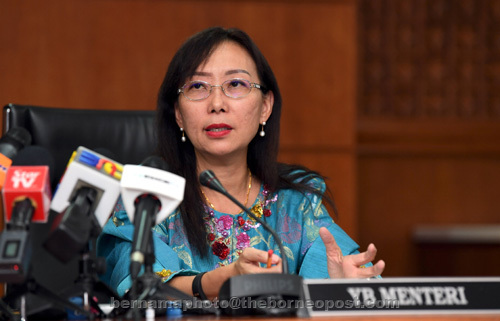 PUTRAJAYA: The Sarawak government will not issue any new licences for the expansion of oil palm plantations, in line with its commitment to halt their enlargement, said Primary Industries Minister Teresa Kok. “So, the accusation that Malaysia is trying to expand its plantation area is not true as both Sabah and Sarawak have given their commitment not to do so,” she told reporters at the Certified Sustainables Palm Oil (CSPO) Forum 2018 here today. In September, Kok stated that the government would not allow any more expansion of oil palm plantations in the country and was committed to maintaining at least 50 per cent of its land as forest cover. As for Peninsular Malaysia, she noted that there were also consensus by all states pertaining the expansion issue. Addressing concerns of major importing markets for certified sustainable palm oil, she said Malaysia, in May 2017, agreed to implement the MSPO certification on a mandatory basis by Dec 31, 2019. On the timeline , she said the government would not extend the deadline for now, despite concerns that smallholders might not be able to abide by the rules. “Initially, it was initiated on a voluntary basis but our players were not taking it seriously. (But) We are (now) taking MSPO seriously and will ensure that by Jan 1, 2020 all exported crude palm oil are certified. This would enable us to compete with others in the international market,” she said. Kok said the government would reevaluate the situation after the deadline, but there were risks as uncertified palm oil might not be accepted by mills and refineries. As at Oct 31 this year, 1.26 million hectares of oil palm planted areas were MSPO certified, accounting for 21.7 per cent of the total planted area of 5.8 million hectares, she said. In term of categories, she said 436 plantations or estates (of more than 100 acres) with a total area of 1.13 million hectares had been certified or about 31.8 per cent of the total planted areas. However, she noted that the certification progress for smallholders has been slow with only 134,701 hectares (5.9 per cent) had been MSPO certified from the total planted area of 2.27 million hectares. Kok said government would continue to explore measures to facilitate certification of the industry and in the case of smallholders, the option included stationing additional officers or Tunas officers in the field to provide technical advice. “I am optimistic that with the congregation of all stakeholders in the whole supply chain, we will be able to explore new and innovative ideas in moving forward with MSPO.